Hurricane Ike pretty much washed away the Buchanan Gallery from Galveston Island. I'm grateful to artist Kathy Boortz and her husband Chet for recovering a lot of my work from the flood ravaged gallery and bringing them back to Dallas. 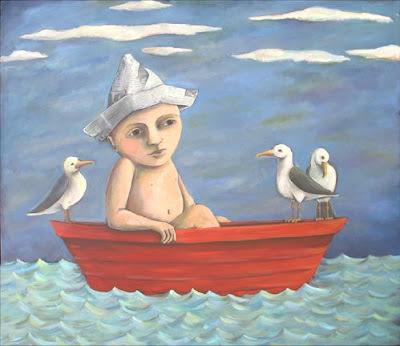 The only painting of mine that sustained any damage was a water themed painting entitled "The Boy Who was Raised by Gulls". Ironic? I lost a couple of pieces of sculpture, but I am thankful to have recovered most of my work. I had written off the possibility of anything surviving. Thank goodness Kathi and Annie are okay. Kathi Buchanan is determined to rebuild her gallery, but she may do it in Houston for awhile. I'm hoping that everyone can come home and help to rebuild the city soon.